Three things that landed this week that everyone should know about. Knuffle Bunny Free – One of the many joys of having young kids is having a chance to read Mo Willems books over and over again. The Knuffle Bunny books are huge in my house and this third and final installment in the trilogy may be the best yet. Its warm, funny and has a really positive message without being preachy. A number of staff members here got a bit misty eyed at the end. Blood Meridian 25th Anniversary Edition – Hooray for the marketing and design department at the Modern Library for choosing to use the original artwork from the 1985 edition of the classic for this newly released anniversary edition. If you want an original hardcover first edition of this book, you can get one that has been stepped on and has spent time floating in someone’s bathtub for about $700. A clean copy will probably run you about $1,500. So this handsome new edition at $22.95 is a steal. Some argue that this is McCarthy’s best book. That’s kind of like arguing about whether you like Van Gogh’s Starry Night over his Sunflowers. 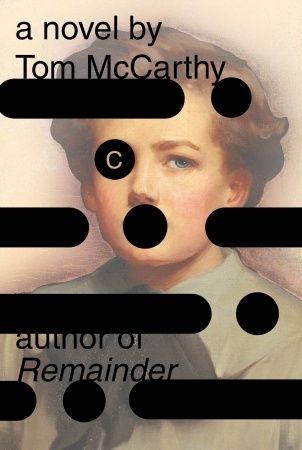 If you’ve only read McCarthy’s latest works, do yourself a favor and check out this masterpiece. Paris Review Issue 194 – This is the first issue under the new editorial leadership of Lorin Stein and I find it to be a stand-alone case for not only literary journals but the value of print over electronic media. If I were to have received this issue electronically, I probably would have skipped quickly to the story by Sam Lipsyte (whose novel, The Ask, I loved) and possibly moved onto Lydia Davis’ translations of Flaubert’s stories. I would have stuck to what was familiar and then moved onto the thousand other things that are asking for my attention on my laptop and iphone. But sitting down with the journal without distraction, I found myself reading it cover to cover. I discovered a great new voice in fiction, remembered how much I like and am challenged by the poems of Frederick Seidel, and learned that I could be moved by an essay about, Andrew Lytle, someone I knew nothing about previously. If you haven’t checked it out yet, there’s a great review of this issue by Maud Newton and an offer on that site for a discounted subscription rate. Of course we have it on our shelves as well. No, no. Not Christmas. Though that is pretty great from a retail point of view. I'm talking about CALENDAR SEASON! 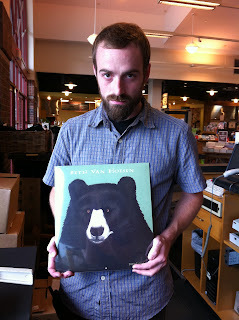 We've been busy little bees here at Third Place Books unpacking box after box full of 2011 calendars. Wall calendars, desk calendars, page-a-day, mini locker calendars; our calendar racks are bursting at the seams and we're still unpacking more every day. 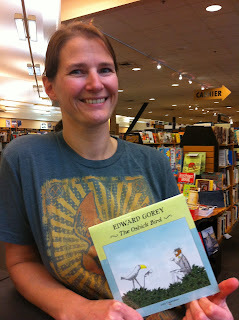 Emily is excited to welcome back the Edward Gorey mini-wall calendar. Every year it's based on a different Gorey book, this year's installment is The Osbick Bird and quite sure, like its forebears, to sell out quickly. Chris is channeling the Black Bear on the cover of this year's Beth Van Hoesen wall calendar featuring portraits of animals staring straight into your soul. Who wouldn't want a chinchilla or a cougar boring holes into you while you get dinner ready for the family? Moleskine has long been known for their finely crafted and beautifully designed journals but several years ago they ventured into the world of engagement calendars and the results were electric. Autumn's favourite calendar this year is Moleskine's "Colour a Month" daily diary/planner. Each month is separated from the whole in its own jewel toned notebook perfect for slipping into a pocket or purse and jotting down thoughts, observations, poems, or song lyrics as they occur. Seriously, Autumn's in love with this gorgeous little set. 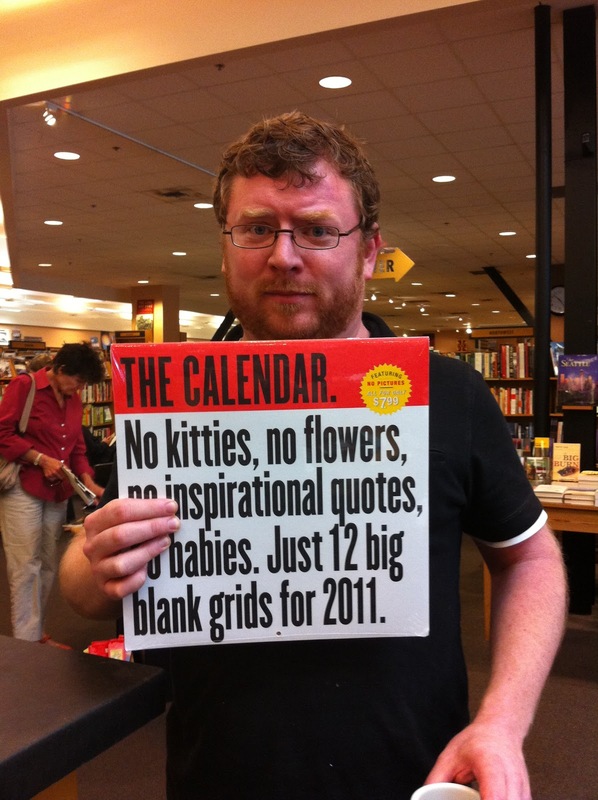 Swing on by the bookstore any time to pick out your favourite calendar but keep in mind that a lot of the really cool calendars can sell out pretty quickly so time is of the essence! If you have a special request for a calendar let us know, we might be able to order something in for you. 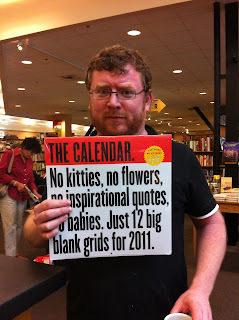 As we march ever closer to the madness of the holiday shopping season the calendars keep appearing. If anything else pops up that's just too awesome we'll be sure to let you know! Monica has been at Third Place Books just over a year, and her insatiable appetite for books have quickly made her a part of the fabric. Though she continues to read books hot off the presses, Monica has a tender spot for a childhood favorite, the creator of everyone's favorite orphaned red-head. 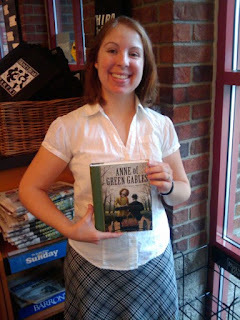 Bookseller sans awesome hat dressed as Anne Shirley for Halloween 2009. Q. Who was L.M. Montgomery? Lucy Maud Montgomery was a Canadian author who, like her most famous character, Anne Shirley, was raised by two strict older guardians in a small town on Prince Edward Island. And like her most autobiographical character, Emily Starr (Emily of New Moon), she lost her mother when she was very young but her father remained in her life until she was seven, at which point he moved to Saskatchewan and she was given over to the aforementioned grandparents. She grew up to work as a teacher and a journalist, always writing fiction in her spare time. After some romantic chaos, including several proposals and one broken engagement, she married a minister named Ewan Macdonald. As with both of her well-known heroines, Montgomery was a lonely child and relied upon her imagination for her entertainment and happiness. As an adult, she said, "I cannot remember when I was not writing, or when I did not mean to be an author. To write has always been my central purpose toward which every effort and hope and ambition of my life has grouped itself." While her heroines grew up to happy womanhood, Montgomery continued to use her imagination and her writing as an escape throughout her life. Q. How did you first learn about L.M. Montgomery? When I was eight, someone gave me a copy of Anne of Green Gables and I devoured the whole series, learning some words that were unusual for a third-grader, like "fortnight." I rediscovered the books in college when I needed some reading for a long train ride: I picked up a box set of the Anne series and read my way through three in a row before falling asleep. Q. What's your favorite work and why? I like the Anne series best, although the Emily books are engaging in their own right. At the moment, I'll give the title of "favorite work" to Anne of the Island, which makes for some lovely college nostalgia and romantic drama. I haven't been able to determine if it's authentic or apocryphal, but I do like "I am simply a 'book drunkard.' Books have the same irresistible temptation for me that liquor has for its devotee. I cannot withstand them." Montgomery and I are kindred spirits in that regard. Q. What's the most outrageous thing about the author? After all those sweet and wholesome books about Anne and her family, Montgomery wrote a ninth book entitled The Blythes are Quoted. The book reportedly (it's available in Canada, but not yet released in the US) blends poetry attributed to Anne and her son, Walter; stories which take place in the family's hometown; and dialogues between Anne and her husband, Gilbert. In addition to this unusual blend of formats, the book also takes on topics such as adultery, illegitimacy, revenge, murder, and death - a significant departure from Montgomery's typical rose-tinted depictions of the Victorian and Edwardian eras. The book was published in part as The Road to Yesterday and has only recently been published in full. 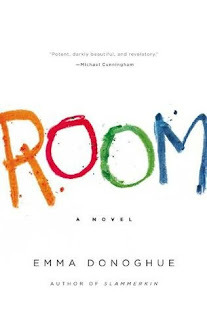 Tom McCarthy's C and Donoghue's Room just came out today. 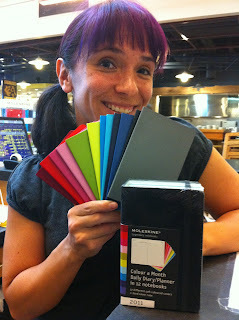 Come and check them out as they smolder on our new hardcover table! The prize will be announced Tuesday, October 12th so you still have a bit of time to read and cast your vote. Watch for flying pigs in the LFP! Brandon is clean shaven and Jessica has gone relatively au natural. Chris - bookseller, used book buyer, and fiction maven - is this week's interviewee for Dead Writers We Like. An aficionado of short fiction, and with a special affection for the vibrant but dusty literature of Latin America, Chris has selected Adolfo Bioy Casares, the Argentinian novelist and short story writer, as an author well-deserving homage. Q. How did you first learn about the Casares? 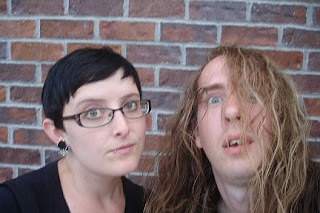 Chris: I was first introduced to Casares by a coworker of mine at Third Place Books. He handed me The Invention of Morel, his best known work, and told me "You'd like this." It was one of many things he handed to me over the months I worked with him, but Casares' work, particularly that novel, has stuck with me the most. So, I guess you could say that my interest in Casares is relatively new, but the type of fiction he wrote, mainly fantastic or speculative fiction, was something I had been interested in for years. Plus, the edition he gave me was an NYRB (New York Review of Books), a series of reissued, long neglected "classics." Q. What's your favorite work by Casares? Chris: After reading most of his fiction I still find The Invention of Morel to be his finest work. 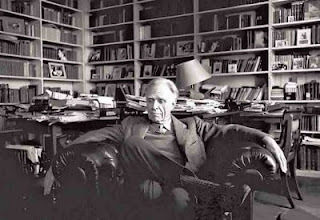 I should mention that Casares was known for his relationship with Borges, a collaborative literary friendship that remained strong and vibrant for decades. Borges, who I was already familiar with, amazed me with his erudition, his intellectual puzzles and his ability to create a fictional universe so convincing that you had to do your research in order to realize his was making it all up (or most of it). However, his work often left you feeling a little cold, distant, somehow removed from real life. Casares on the other hand was a writer that took the fantastic, the playfulness, the idea-driven fiction of Borges and infused it with human emotion, with everyday situations, with LIFE. Morel is essentially science-fiction (it borrows heavily from H.G. Well's novel The Island of Doctor Moreau) in that it imagines a scenario quite unlikely to exist, yet convincing portrays a man dealing with very real problems. The novel is an exploration of madness and isolation, what it means to love and be loved, and what sacrifices one is willing to make in order to achieve fulfillment. The novel also inspired Alain Resnais's film Last Year at Marienbad which is considered by many (myself included) to be one of the great surreal films of all time. Casares' other works, which include seven novel and hundreds of stories, are all highly compelling and employ a similar idea-based narrative rich with human complexities. His novel Asleep in the Sun portrays a man whose wife literally turns into a female dog, in Diary of the War of the Pig the senior citizens of Argentina are being systematically killed off by the youth, and in Dream of Heroes the protagonist must recreate the events of one fateful day that have become an obsession. Unfortunately, most of his work is out of print and hard to find. Let us all thank NYRB for reissuing Morel and Asleep in the Sun. Chris: It's hilarious to note that one of Borges and Casares's first collaborations was a pamphlet on the virtues of yogurt. Sound like something Pablo Neruda would have written an ode to (maybe he did?). 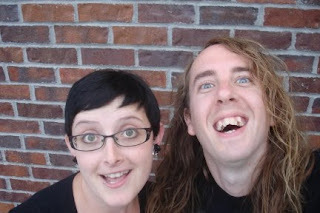 Oh, and how cool is it that we share birthdays! Q. And what's your favorite quote? Chris: "But still I feel (perhaps I only half believe this) that if she looked at me for a moment, spoke to me only once, I would derive from those simple acts the sort of stimulus a man obtains from friends, from relatives, and, most of all, from the woman he loves." - A.B.C. from The Invention of Morel.